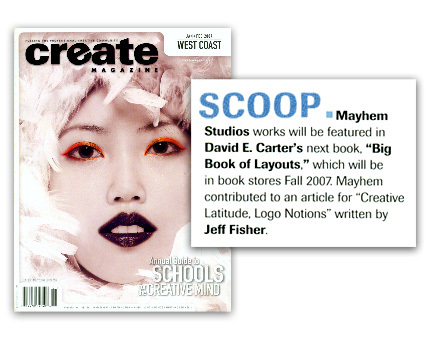 Method to the Mayhem: Create Magazine: We Got The Scoop! Create Magazine: We Got The Scoop! I was at Barnes & Noble book store this past weekend, browsing through the new design books and magazines. While flipping through the Jan/Feb west coast edition of Create Magazine. To my surprise, I received a little mention in the Scoop section. It also mentions an article I contributed to for "Creative Latitude, Logo Notions" written by designer Jeff Fisher, Logomotives. AWESOME! Congrats. I've never had my name or company in offline print media, it must feel great! What book aren't you in? Congrats!